You will earn 11,400 Reward Points. Earn 1 reward point for every 1 dollar spent. Market Deli. The low profile merchandiser that provides solutions to your fresh food merchandising needs. Cases are available in lengths of 3', 4', 5', 6', and 8'. Designed for continuous case line-ups without middle end glass. UL & UL Sanitation Listed. Pedestal or panel base design. Tempered front and end glass. Designed for continuous case line-ups. Stainless steel interior and exterior finish. Lift-up, pneumatic, cylinder-assisted curved front glass. Average case temperature of 36° to 38°F is maintained. Removable rear door assembly. Doors not required for operation. Appliance receptacle provided on back for cash register, scale, or slicer. 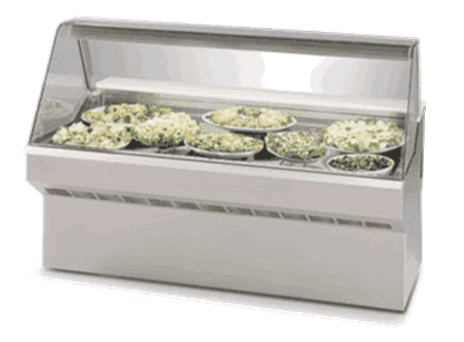 Oversized coil and low-velocity fan system maintains product freshness and high humidity. Solid-state control panel with main power, light, and temperature readout; humidity control optional.